Get the conversations started with in-lesson discussions. In an in-person class, teachers and students stop and have engaging discussions about a topic. At Wet Ink, you can have that same experience online by embedding questions into your lessons. These questions appear within lesson, rather than later in a forum. Students are asked to respond to the question and can also discuss each other’s responses. 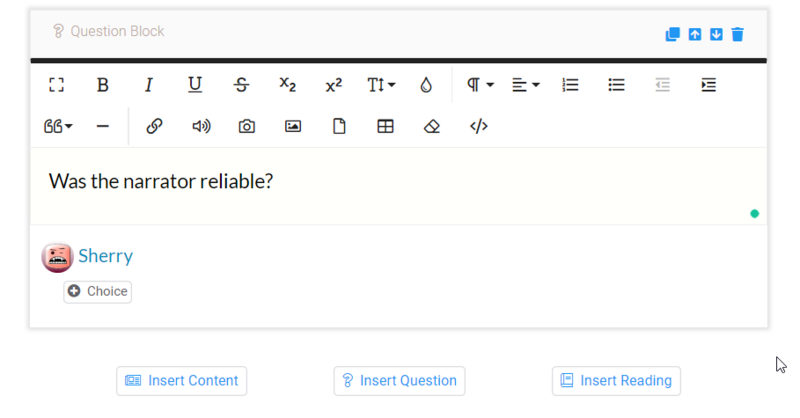 After adding content, such as text or a video, using the Content box, you can add a question to immediately follow. Type in your question in the 'Question Block'. You can use the variety of formatting options, including adding images, videos, etc. This is how a discussion question appear to the student.